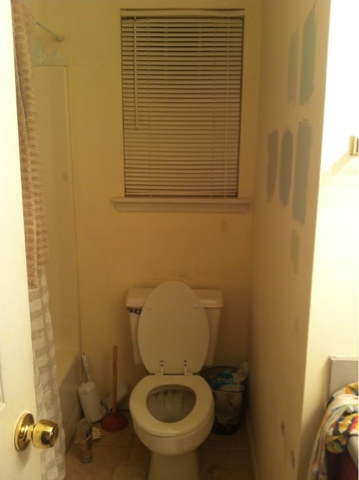 This past weekend I FINALLY finished the bathroom walls. I had to endure the process of removing painted over wallpaper and patch the walls to repaint. 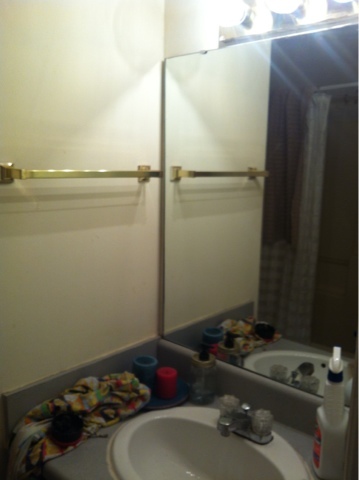 Lets just say this has been the most work I’ve ever put into a house project so far, and I did it completely by myself. Of course I had some guidance and I googled ALOT. But I wanted to share with you what worked best for me. When I first started the worst problem was the wallpaper coming down in small pieces. I tried scoring it and spraying it with wallpaper removal spray. Nothing really worked for the top layer at least. So I took it one day at time to slowly get off all the paper. This was only getting off the top layer and the backing paper was still on the wall. The backing paper was no problem, once sprayed with the remover it came off easily. So days and days of work later, all the wallpaper is completely off the wall. And I’m left with ripped drywall all over the place, since it wasn’t properly primed before being put on the wall it wasn’t easy to get off. I wiped down the walls with hot water after all the paper was off to make sure I got off any remaining glue. Then searched for the right primer/sealer. I googled ALOT to find the right sealer for the ripped drywall. 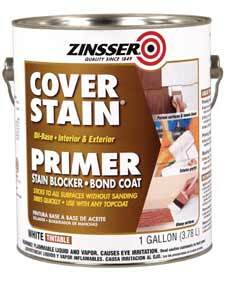 The best thing I came across was Zinsser Cover Stain (oil based). I tried other things first that didn’t work well or at all. But the Zinsser went on smoothly and didn’t make the ripped paper ripple at all. So I put the Zinsser primer on the walls including the ripped drywall areas as well, THEN spackled over the ripped drywall areas and any other problem areas. Next, I sanded down the spackled areas and wiped the wall down with hot water again. Then did another coat of the Zinsser cover stain. Make sure to use this stuff in a well ventilated area, I just about passed out even with windows open… It is very strong smelling. FINALLY after the second coat dry, my walls were looking great (in my opinion haha). 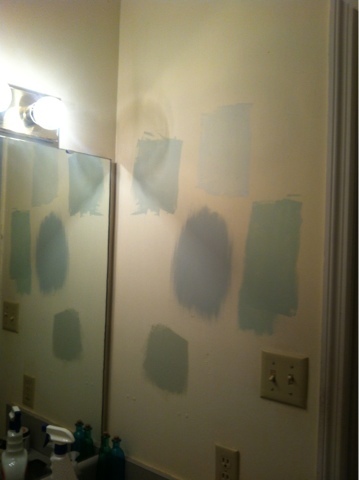 I then painted the walls with a semi gloss pale green. It came out pretty darn good if I do say so myself. I’m really proud of myself for sticking with the project. There were so many times I wanted to give up and thought I didn’t know what I was doing. And at some points REALLY wanted to hire someone. Obviously I didn’t and that is pretty gratifying to know I did it myself and saved a ton of money that way. So I’d have to say the lesson from this would be to trust yourself! Keep moving forward with your project if you have an idea of what to do! Just give it a try, with a lot of research and advice from others you may can actually do it yourself! Here’s some video of part of the process and how it ended up coming out!